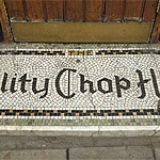 The Quality Chop House is well known restaurant and wine shop in Clerkenwell. 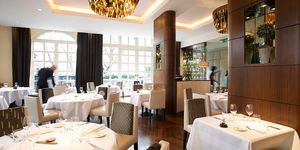 Accommodating 40 diners, the Quality Chop House offers a concise lunch time menu and a 4 course evening menu. Located next to the restaurant is a wine bar and shop where there is a wide choice of interesting wines that change monthly. 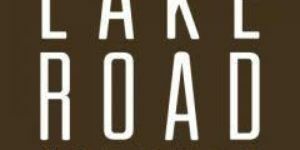 Do you work at Quality Chop House? What did you think of Quality Chop House? Having regained its moniker, via a slightly strange stint as a meatball merchant, the Quality Chop House returns with verve, offering some pretty impressive British fare from a venue heaving and heavy with history. 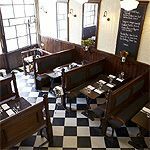 Just around the corner from Exmouth Market, the Quality Chop House is one of those places that have an esteemed place in the hearts of long-time Londoners. Meatballs, its last incarnation, was a slightly odd affair, so it’s good to see this famous place return to something approaching its former glory. 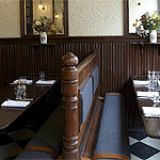 The interior remains pretty much the same, with checkered flooring, tight wooden pews and chalkboards displaying what’s on offer each day, as well as a few bits and bobs that definitely fall into the category of kitsch (the plates, primarily). The seating in both the bar area (accessed via the right hand door) and the dining room (via the left) isn’t exactly the most comfortable, and the venue itself can border on the cold (if not the quite the clinical), but it’s a pleasant enough spot that seems to suit its emphasis on clean, honest food done well. 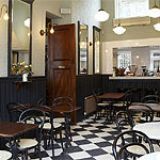 Varying degrees of lunchtime business give way to busy evenings, where foodies flock to Clerkenwell by way of habit - and to the Quality Chop House following a number of very positive recent reviews. Consequently the evenings are vibrant and fun affairs whereas lunchtimes are more likely to be less so, but at all times staff seem into what they’re doing and eager to please, even if an invite to sit on the same tiny table as another couple, when plenty of others are free, is way past odd. The bar area offers more flexible dining, with small plates, heartier mains and charcuterie all on offer, whilst the restaurant proper keeps things very simple indeed, with a set menu (with no choice) of four courses for £35 (with a supplement for cheese). Both menus are good, if not faultless, with picks from the bar including a very decent Basque charcuterie plate (chorizo, Jesus salami and saucisse seche with a lovely chilli kick - £9.50); a pear, chicory and watercress salad (adorned with unadvertised, but welcome, stilton and some slightly limp pear - £7.50), and some deliciously roasted beetroot served alongside some fluffy light goat’s curd and a healthy smattering of pine nuts (£6.50). Cornish fried fish (£6.50) is a little heavy on the batter, the fish a smidgeon tough and the smoked aioli not particularly smoky, but a beef ploughman's (£11) is very fine indeed, with rare roast beef, excellent bread (grilled, and with lots of butter), rocket and pleasingly restrained pickles adding a bit of tang. 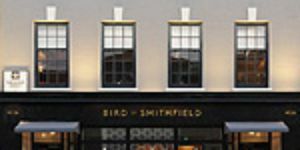 The evening menu is a tad more consistent, with head chef Shaun Searley (previously at Bistroteque) looking like he’s drawn inspiration from a few nose-to-tail eateries, particularly St John (and why not?). 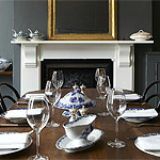 Expect things like bone marrow and walnut toast with a cute little crab croquette; monkfish in a hearty bisque and a suitably punchy tapenade; some great Denham Estate lamb cooked to rosy (with horse parsley, kale and Jerusalem artichokes); and a brilliant apple and rhubarb crumble with thick, sweet custard. It’s a very satisfying menu, with food that offers the kind of comfort the rooms sometime lack. With the bar doubling as a wine shop, they clearly know their onions when it comes to the booze. Admirably, each of the 90 bottles are given a £10 mark up (except a few of the more expensive ones, which rise to £20), which offers some pretty impressive value. Even the least expensive white, a 2012 Sola Fred Blanco from Montsant, is pretty good – a balanced blend of Macabeo and Grenache that’s pretty darn drinkable. Prices do rise to just over a ton, but when you can pick up a 2010 Les Narvaux Meursault (Vincent Garardin) at just £57, you know you're onto something good. A ‘collector’s list’ raises the stakes a little further, but even though prices do rise up to £260 these are exceptional drops – not least a 1975 Chateau Leoville-Las Cases Bordeaux Blend at a very reasonable £150. With the kind of food that demands to be snaffled, and wines that will please the pocket and the palate, the Quality Chop House makes a very welcome return. Go when it’s busy, and enjoy. We had a great meal at the QCH on a Tuesday evening. I have a special diet and when I told them this in advance they catered their set menu to accomodate me. The food was great, my companion said his main included the best beef he's ever eaten. My main wasn't perfect (fish and potatoes in a broth), but it was acceptably tasty. I could have eaten another serving of the snacks (beetroot salad / fried jerusalem artichokes) and the dessert (poached rhubarb and pistachio meringue) they were delicious. The wine was so good I was gushing about it the next day. The service was exceptional - our servers were friendly, helpful and relaxed. They didn't rush us or hover around us although we took our time and the place was not very busy. They knew their menu and wine list in detail. The restaurant was pretty - seats a little uncomfortable at first but I forgot about that quickly. I loved the tableware / silver / stemware, too. Overall we spent quite a lot but it was totally worth it and we'll be back soon.